There is a teaching that it is a mitzvah/commandment for each person to study and write Torah. Internationally renowned fibre artist Temma Gentles envisioned a hand-stitched scroll large enough for people to walk among the holy words. More than 1300 stitchers of all faiths in 27 countries have each crossed-stitched 4 verses of the Torah in Hebrew and many have adorned the text with fascinating illuminations. Torah Stitch by Stitch has been invited to present “Tapestry of Spirit” in its museum debut. From June 12 to October 27, 2019 the work will be displayed at the esteemed Textile Museum of Canada in Toronto. Occupying all 10 of the museum’s upper-level galleries, the exhibition will feature the entire books of Genesis and Exodus, along with the final third of Deuteronomy. To place the Creation theme in dialogue with the other Abrahamic faiths, the exhibit will also include selected passages from the Scriptures in Greek and the Qur’an in Arabic. Your generosity means that . . .
You will help to showcase the artistry of a global community of stitchers, to promote cooperation and understanding, and to present the Torah and its significance to a broad public through this wonderfully vibrant medium. This campaign will cover the costs of assembling the individual panels, crafting the display structure, insuring and conserving the artwork. It will also enable us to create educational materials as well as a 160+ page full-colour catalogue featuring the work of each stitcher that will serve as an enduring legacy of the project. Important note: Donations made through Jewcer are tax deductible in the United States only. For more than five years, the creation of this tapestry has been a project of community engagement, education, and empowerment involving people of diverse ages, genders, and religious and cultural backgrounds. 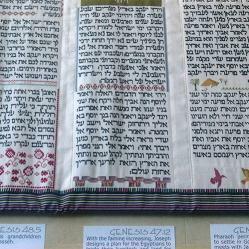 Many participants have never stitched before; most know little or no Hebrew. Each stitcher is assigned a personal coach and is encouraged to explore their verses and and respond with creative expressions and anecdotal information about their experience. An intrepid crew of volunteers do a myriad of organizational tasks as well as stitching together the scroll by hand . . . so far amounting to almost 150,000 hours of dedication to the project. When all sections are complete (and we are over 90% there! ), the assembled scroll will measure 7′ high x 300′ long. . . almost the length of a football field, and likely the largest tapestry in the world. This remarkable project is the subject of a documentary short –“Stitchers: Tapestry of Spirit” – which has won several awards at festivals throughout North America. It will run continuously during the exhibition. Many stitchers make us aware how much engaging in this project has meant to them . . . whether connecting with a larger community, honouring those who taught them to stitch as children, inspiring them to continue learning, even providing solace during difficult times. If you work for a company that matches 501(c)3 donations, please let them know about your gift to Torah Stitch by Stitch and invite them to match your donation. For more information about larger donations or Corporate Sponsorship opportunities, please contact us. Donations may be made to honour the memory of a loved one, to celebrate a life cycle event, or to show appreciation for someone in your community. "I am a stitcher on this project." "This is such a great project. Thank you one and all for doing this." "In loving memory of Rose & Raymond Dorfman, z"l."
"In Honor of Marcia Cohn Spiegel"
"Thank you Amy for your kindness and for showing me this wonderful project! :-)"
"In memory of my aunt and uncles Opass"
"I loved participating in this project and creating 3 pieces that were meaningful, both spiritually and temporally." "In memory of my grandparents." "Thank you for all your hard work." "In memory of my mother, Dorothea Hamilton"
"A beautiful concept, awesome that so many from around the world have contributed time and talent and kavannah"
"In honor of our children and grandchildren, L'dor v'dor: Benjie, Erica, Austin, Emery and Felix"
"In memory of our mothers, Fay Green and Dorothy Teplinsky, who taught us the importance and joy of creating beauty." "in honor of our grandchildren"
"I am honored to have stitched both from Genesis and the New Testament." "Mazal Tov Tema Gentles on the progress of this imaginative project!" "In loving memory of Ellen and David Sonnenschein"
"in honor of Sadie Finkelstein"
"In Memory of my mother, Malka Levine, and all the work of her hands." "In honor of Mama, Norma Krupenie, who loves Torah." "In loving memory of Mollye Plotka Smolkin z"l"
"So proud to be part of this amazing project. Rachelle Lederman"
"In loving memory of Joyce Baker and Olga and Leda Baran, all exemplary women of faith and each a skilled needle women in her own right." "In honor of my dear friend, Amy Bayersdorfer"
"With gratitude to have been included as a Stitcher." "I dedicate my contribution to this important and vital exhibit to my granddaughter, Meira Rani." "In loving memory of my parents Victor and Rose Markin"
"What a privilege to be a stitcher..."
"Thank you for your request to donate Lili. Hope to see you soon." Congregation Beth El, Sudbury, Ma. "We are so happy, as a community, to help sponsor this beautiful project." "In recognition of the extraordinary dedication and vision of Lili Shain, Board Chair of Torah Stitch by Stitch. Kol Hakavod!" "to Amy, in honor of her contributions to the project." Torah Stitch by Stitch is a not-for-profit volunteer organization located in Toronto Canada and founded by Temma Gentles, a renowned Judaic textile artist. She is supported by a seven member board and group of dedicated volunteers who have already given 50,000+ hours to TSBS. Our mission is to inspire a love of Torah by engaging a widespread community in hand-stitching a "Torah Like No Other", and to share this extraordinary work with the public. Chai sponsors ($18–$35) will be acknowledged on the Torah Stitch by Stitch website. Double Chai sponsors ($36–$53) will be acknowledged on the Torah Stitch by Stitch website, and receive 🔺 a high resolution digital image of a stitched panel you select. Even More Chai sponsors ($72-$179) will be acknowledged on the Torah Stitch by Stitch website and receive 🔺 your choice of 6" x 6" fine art print of a stitched panel. Illuminator sponsors ($180-$499) will be acknowledged on the Torah Stitch by Stitch website and 🔺in the exhibition catalogue; and will receive 🔺 your choice of 6" x 6" fine art print of a stitched panel, and 🔺 and a copy of the exhibition catalogue. Cornerstone sponsors ($500-$999) will be acknowledged on the Torah Stitch by Stitch website and 🔺 in the exhibition catalogue; and will receive 🔺 your choice of 14" x 14" giclée print and 🔺 a signed copy of the exhibition catalogue. Pillar sponsors ($1,000-$1,999) will be acknowledged on the Torah Stitch by Stitch website and 🔺 in the exhibition catalogue; and will receive 🔺 your choice of 14" x 14" giclée print, 🔺 private screening link to documentary short film, "Stitchers: Tapestry of Spirit", and 🔺 a signed copy of the exhibition catalogue. 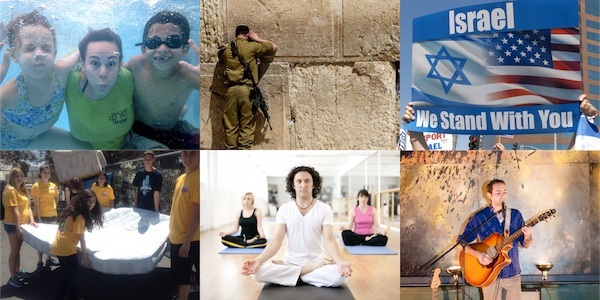 Guardian sponsors ($2,000-$4,999) will be acknowledged on the Torah Stitch by Stitch website and 🔺 in the exhibition catalogue; and will receive 🔺 your choice of 14" x 14" giclée print, 🔺link to documentary short film, "Stitchers: Tapestry of Spirit" for public viewing in your congregation or community, and 🔺 a signed copy of the exhibition catalogue.